Boys' lacrosse finished out its first season at the varsity level with an impressive 11-5 record. Under the leadership of head coach Brian Callahan, the team made its way to the quarterfinal round of the NJSIAA Non-public B tournament. The season opened on April 4 with a resounding 22-1 victory over Edison. The team followed up with two more decisive wins in quick succession: 16-2 over Newark East Side on April 5 and 21-1 over Parsippany on April 9. A strong and varied offense, goals and assists came from Kevin Brito '17, Cameron Burns '17, Nick Cooper '17, Mike Del Priore '16, Lake Jacobson '17, Preet Singh '16 and Ryan Turse '18. 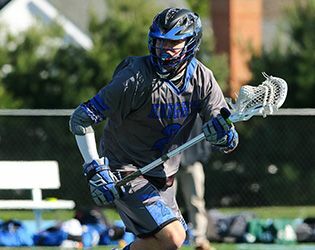 Goalie Will Dadouris '17 came up big in all three games, making 19 saves in total. Despite an impressive outing on April 14 in which Dadouris contributed 14 saves, the Knights lost a tight 11-10 matchup against Oratory Prep. The boys quickly put the loss behind them, however, winning the next two matchups and closing out April with a 21-1 win over High Point. Leading the scoring in the High Point matchup were Del Priore and Clay Goulburn '19, with four goals apiece. Andy Gordon '18, Jacobson, Parth Patel ‘17 and Singh each chipped in with a goal as well. The Knights opened May with a 9-4 win over Kittatinny in which Dadouris contributed 17 saves. After a loss to Peddie on May 7, in which Del Priore recorded a hat trick, the team won its next four matchups: Pennington (14-12), Steinert (12-7), North Brunswick (18-7) and Edison (20-4). In the Edison game—the last of the regular season—offensive powerhouse Copper contributed nine goals and six assists. The month ended with tournament play, in which the boys advanced to the quarter final round of the NJSIAA Non-public B tournament before falling to Gloucester Catholic. Looking ahead to next spring, the team will miss the contributions of senior captain Del Priore, who contributed 33 goals, 15 assists and 43 ground balls over the course of the season. In addition, the team will be without the contributions of seniors Patrick Janas, Connor Klementowicz, Josh Layden and Singh. Returning next spring will be a talented lineup of rising seniors: Brito, Burns, Cooper, Jacobson and Patel, all of whom contributed to the strong offense this season. In addition, the team will rely on goalie Dadouris, who made 197 saves on the season and was voted top goalie for a non-public team this season. Among this year’s sophomores, Gordon and Turse promise to be important factors on offense next spring, and Robert Haversat '18 Jack Herrlin '18 Sebastian Meza '18 Tyler Schrecengost '18 will play increasingly important roles. Finally, the team looks forward to the continued contributions from the rising sophomore lineup: Goulburn, Christian Ernst, Sebastian Laboy and Jake Panza.